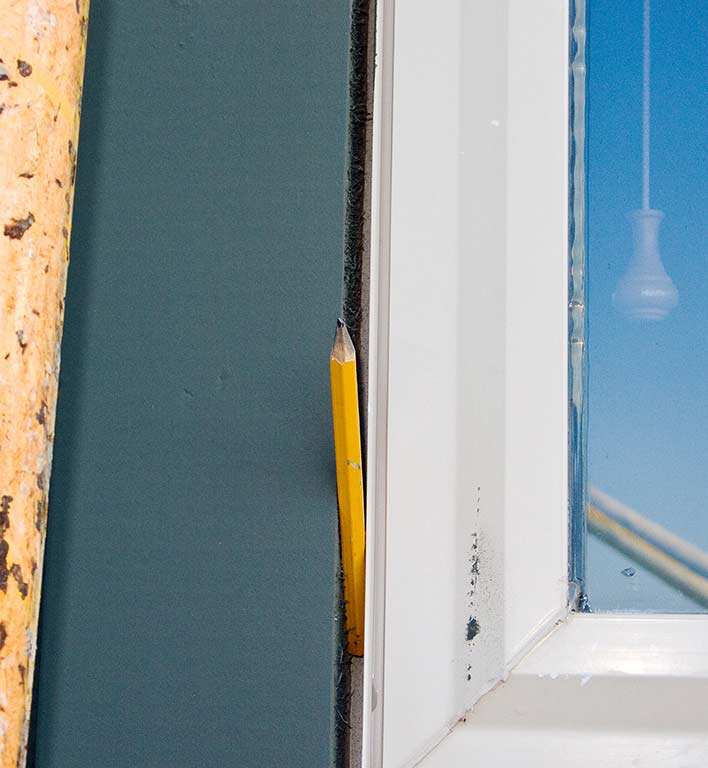 How could we build water-tight windows when this builder couldn’t? 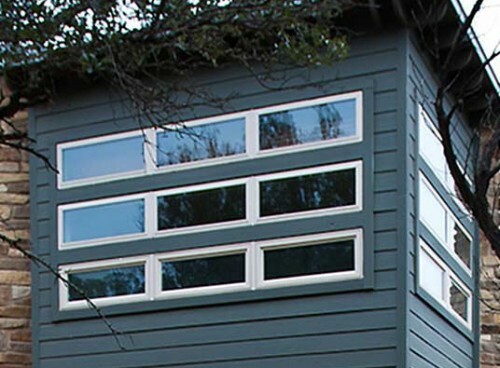 Nearly 30 windows in our Rutherford Custom Home leaked. The leaks began with rains during construction, then homebuilding entered the then-historic Texas drought, which lasted until after we moved in. Our first light rain came after 4 1/2 months in the home, on April, 14, 2009. (See photos.) 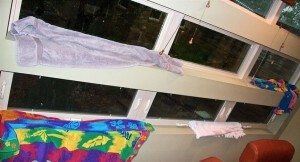 I grew up in a South Florida tract house and went through hurricanes without 1 window leak. 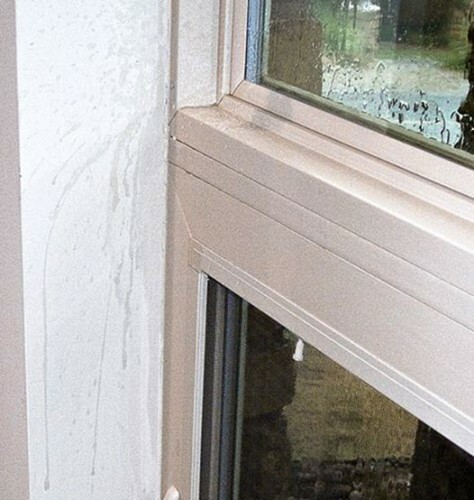 But here, our Rutherford Custom Homes’ windows were leaking in light rains. We called the Rutherfords after the leaks from the first rain. We called again after the leaks from the second rain. The builder twice sent not the windows installer, but a person who didn’t know what had and had not been done behind stone and wood. 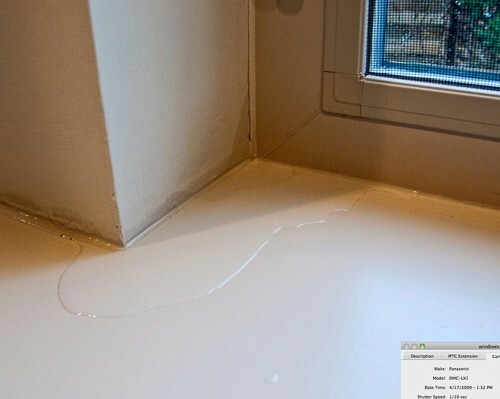 In 3 1/2 months, the builder took no action to weather-seal the leaking windows. Nor did Rutherford Custom Homes act after deep water stains twice were pointed out to Beau Rutherford on window sills, coming up through the paint. We later learned the problem was behind stone and wood. Q: Did you inspect the windows after their installation to satisfy yourself that they were – would be weather tight and free of leakage? Q: And they passed your inspection? (Click to enlarge.) 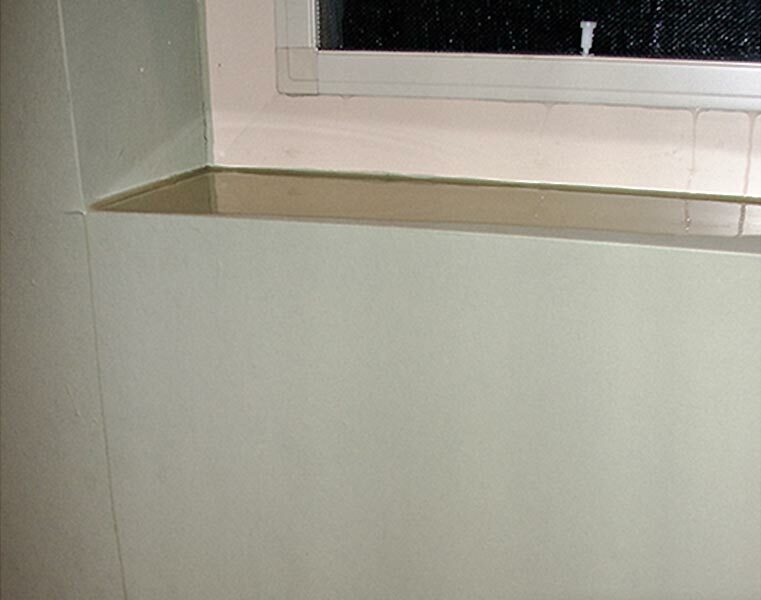 Builder sealed window, top left, behind drywall. Beau Rutherford testified under oath that the windows passed his inspection. 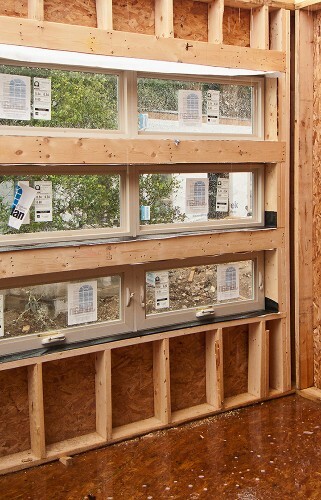 Wimberley builder Beau Rutherford testified windows were properly installed. 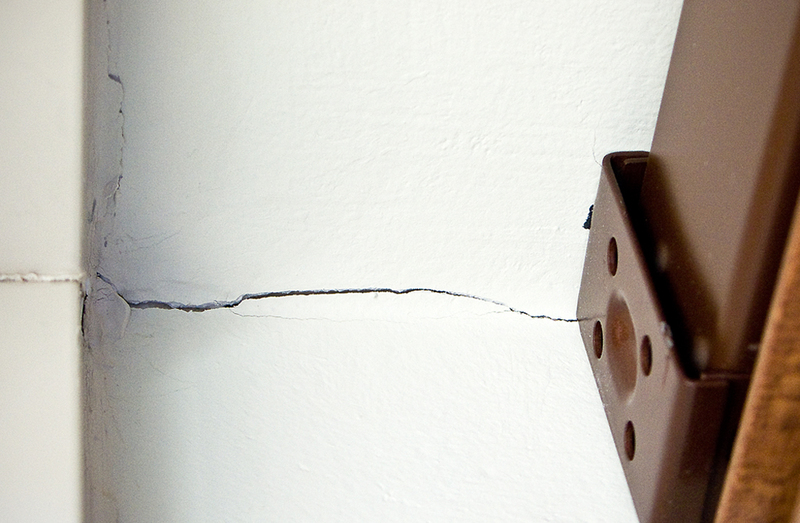 We had the wall cut open. 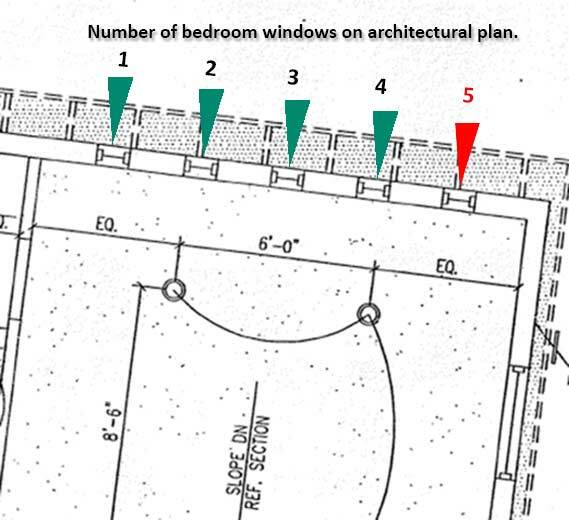 5th window, per architect's plan, is discovered behind drywall. 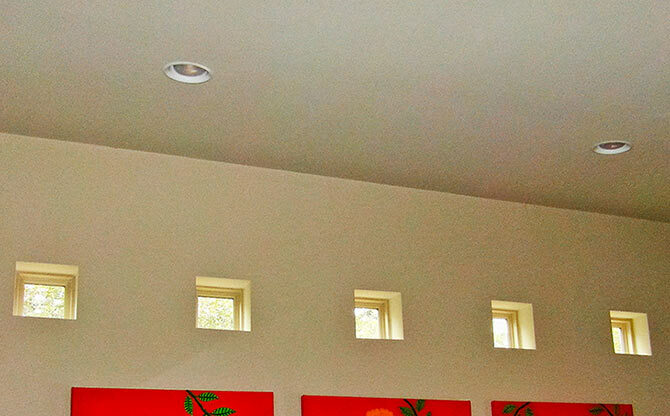 5 windows on the plan, now we have 5 windows in the wall. Rain on long-time water stain that builder ignored in person and in To Do list. First rain, a light one, since living in the home came in through 8 windows on 4/17/09. 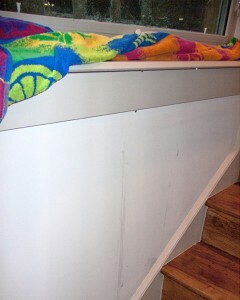 Rutherfords sent a repairman who didn't know and couldn't see behind stone how windows were installed. Water came from walls around windows. Rutherfords again sent person who had not installed the windows after 2nd rain. Water begins flow to wood floor in July, 2009 rain. Running out of towels in TV den. 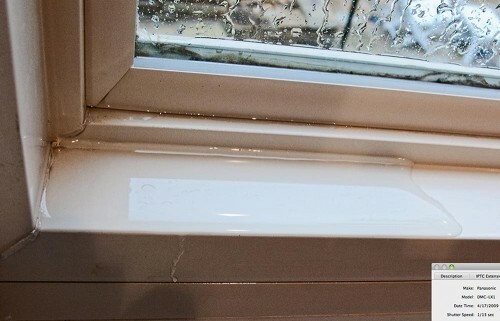 Rain splashed down from above window. 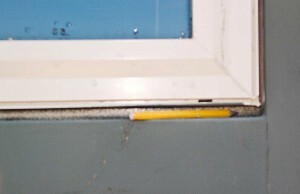 Rain entry cracked window sill, migrated to floor. Another crack appeared in wet drywall. Wall beside window oozed water. A drywall crack above studio window. 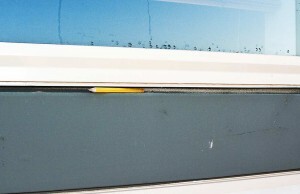 Windows serviceman pointed out bad crack. 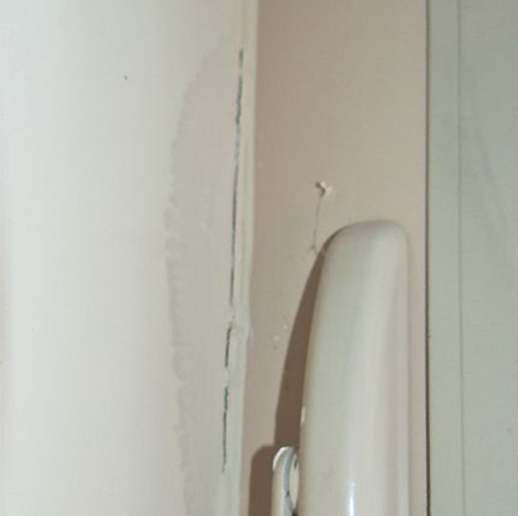 One of water stains pointed out to builder Beau Rutherford. Stain shown to builder, James W. Rutherford Jr., and put on To Do list. Nothing was done. Q: Did you ever receive notice … that the windows were leaking water from outside the house? 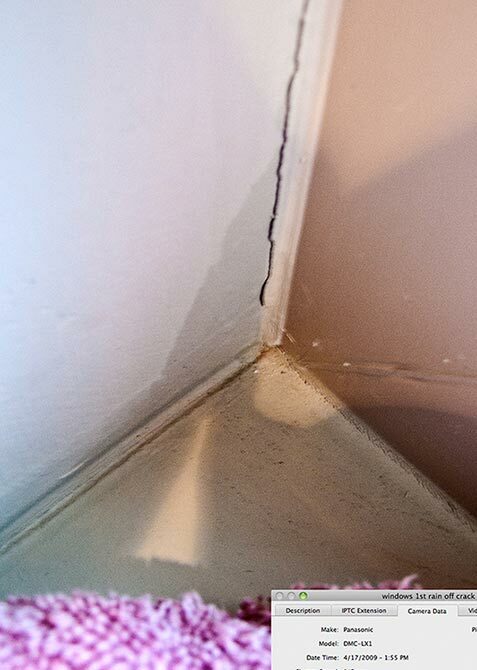 A: Not after the repair (of a year-earlier leak during construction), no. Q: Never got any notice at all? 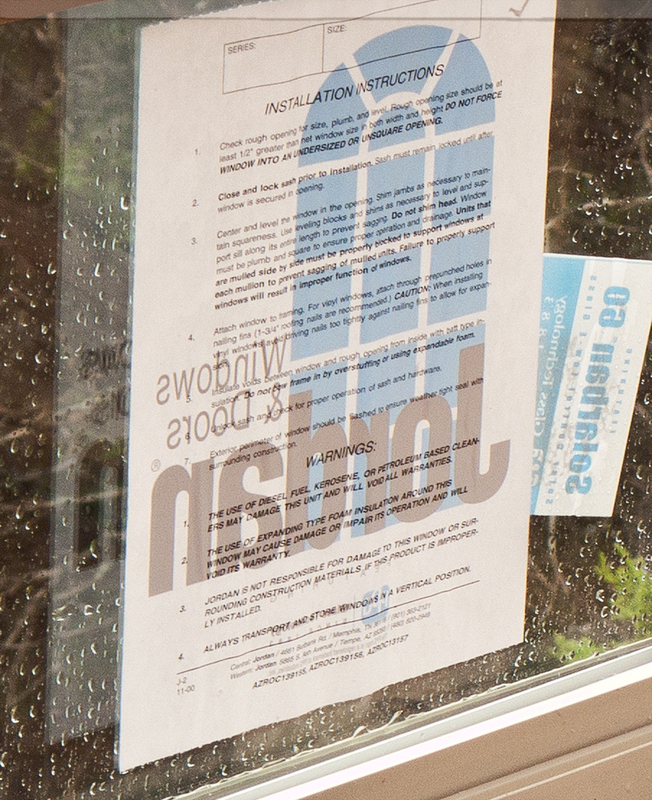 Installation instructions were pasted on every window. No. 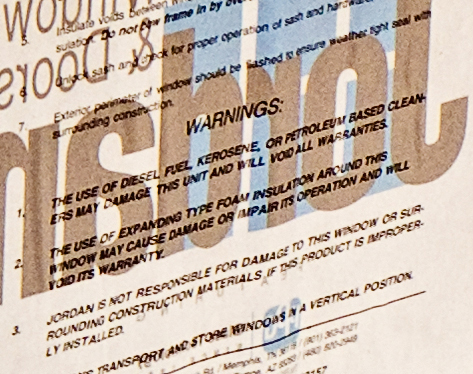 7: ...ensure weather tight seal.... Instruction not followed. Photo and caption from architect report. 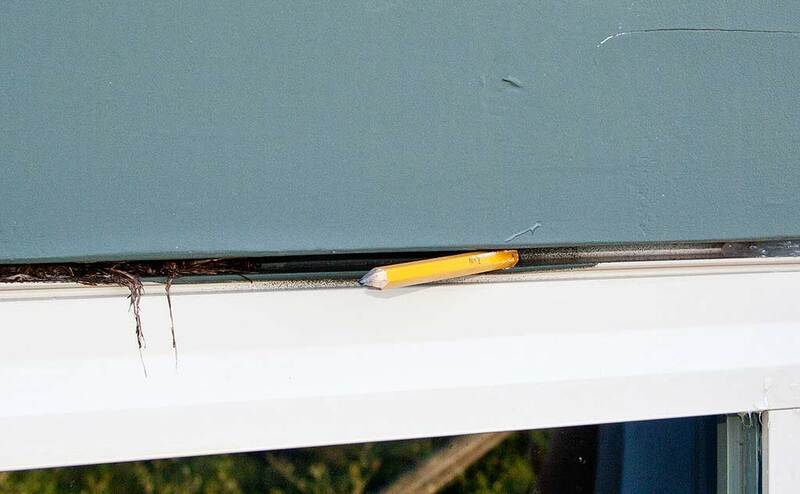 Builder said he addressed unsealed windows problem. 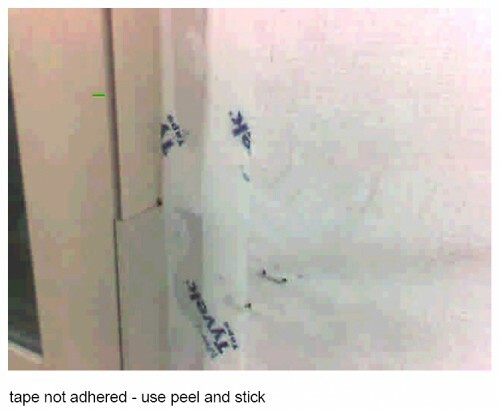 Architect's photo and caption: use peel and stick. 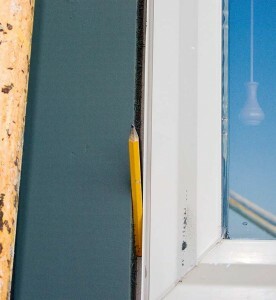 Architect discovered unflashed windows, called for peel and stick. 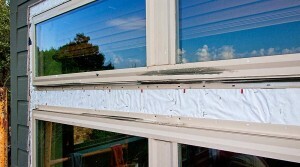 Instructions to weather seal windows removed after architect report. (Click to enlarge.) 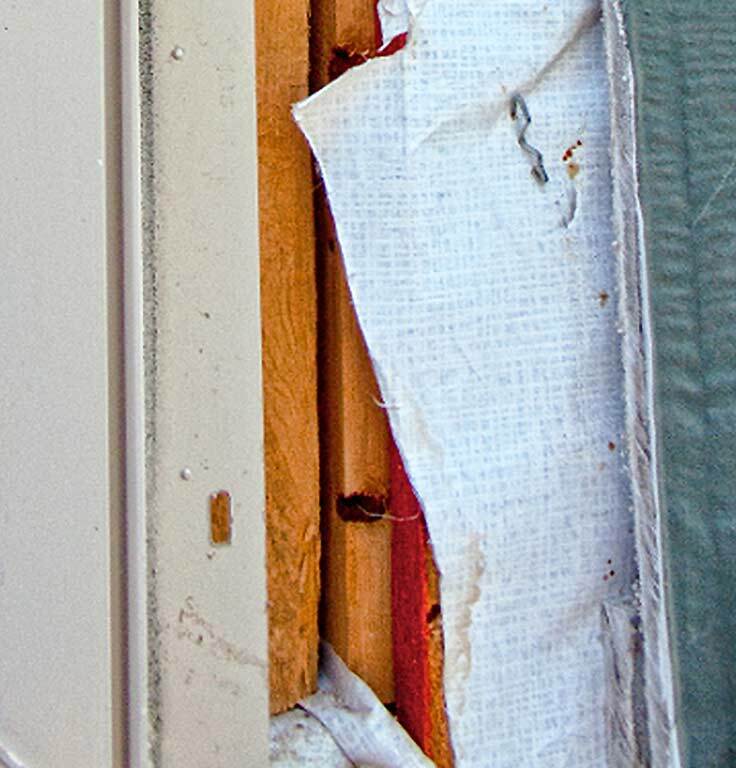 Deconstruction reveals no OSB panel, leaving 1/2-inch opening across top of leaking window. 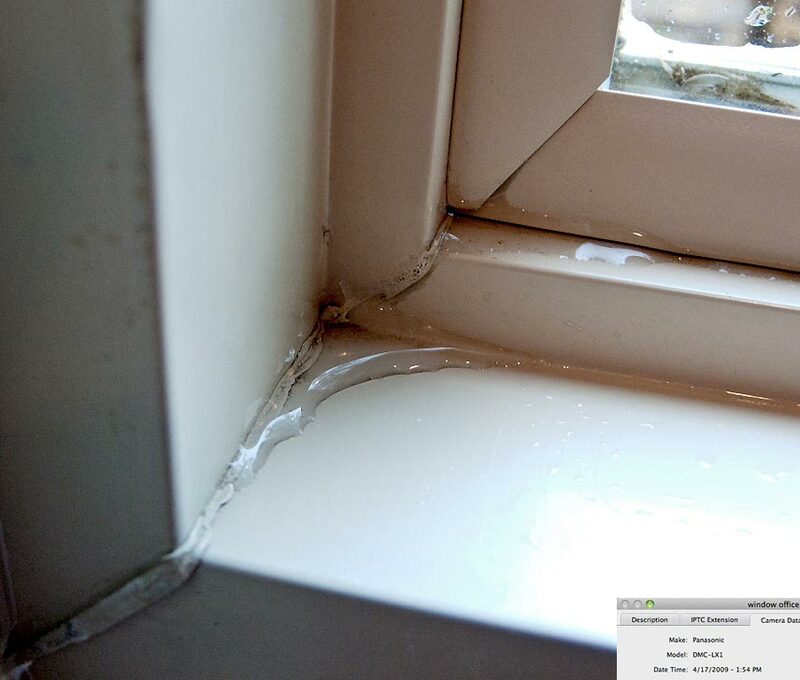 15 leaking windows in TV den. 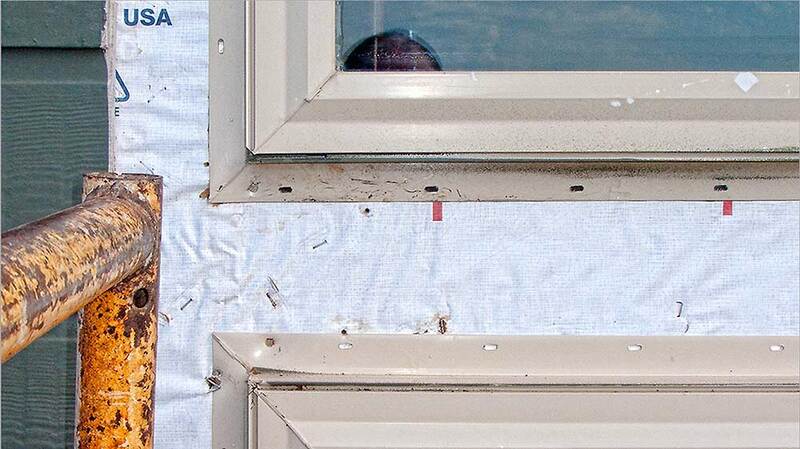 Wind-blown debris, water enter framing gaps, up to 1/2 inch wide. 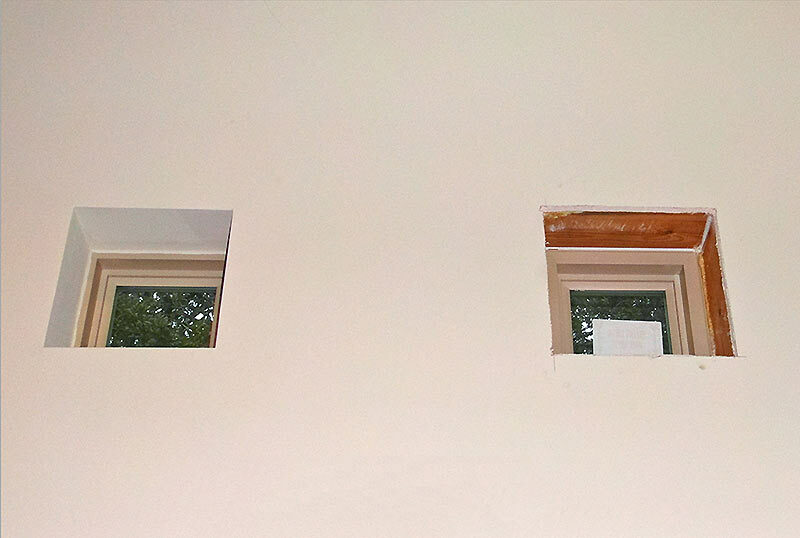 Framing miscut all around these 15 windows. Water entry enabled through big framing gaps. 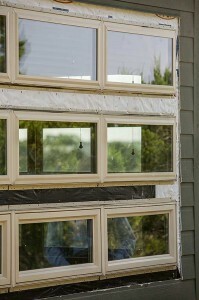 Rutherford Custom Homes-built windows had huge framing gaps. 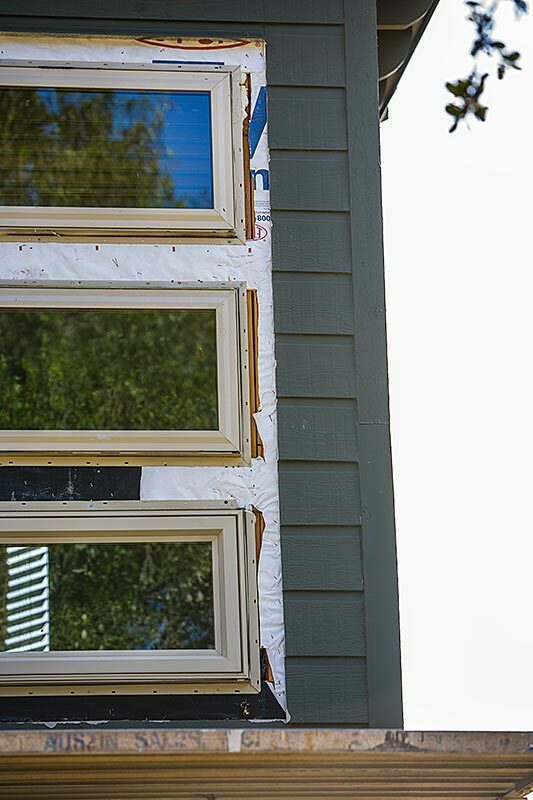 Removed framing reveals that builder did not weather seal windows. 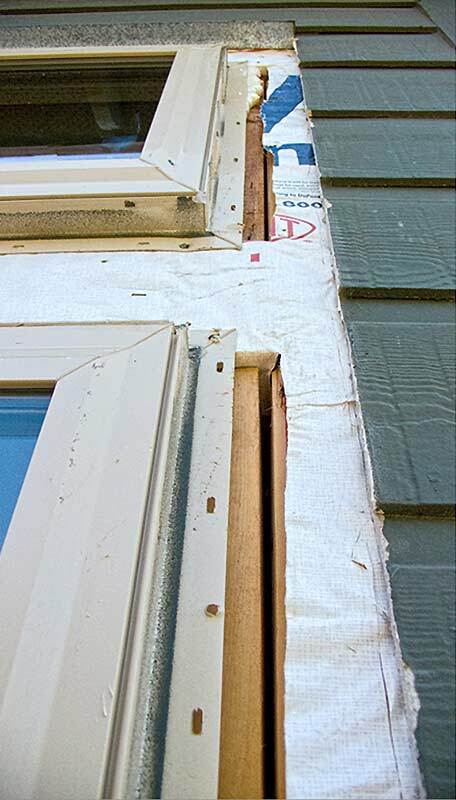 Deconstruction photo shows no peel and stick flashing on windows, enabling water entry into home. Windows installed without sealing them, enabling water entry into home. Architect's report pointed out this problem, called for windows to be flashed. 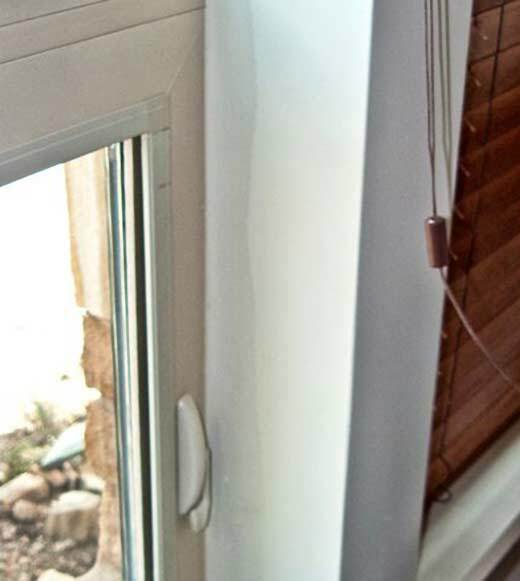 No weather seal on windows. Construction photo shows Tyvek Wrap and OSB gaps at windows. 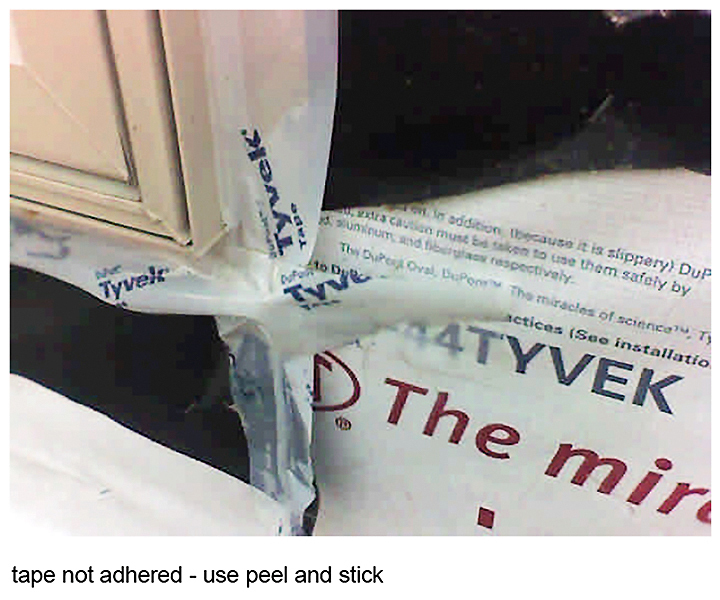 Tyvek was left unpatched, unchanged from 2-years-earlier construction photos. 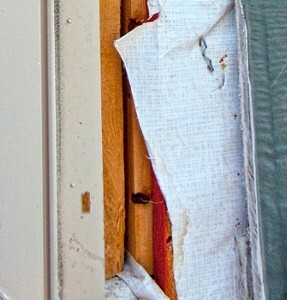 Missing OSB gaps left unfilled, Tyvek left unpatched. 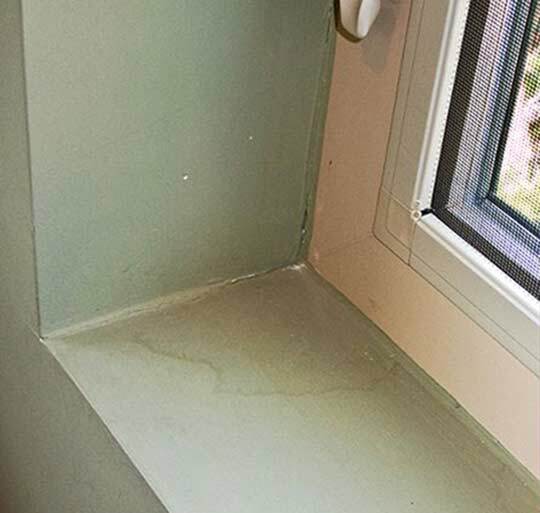 Wall left open, enabling water flow. Builder did not have Tyvek gaps patched. 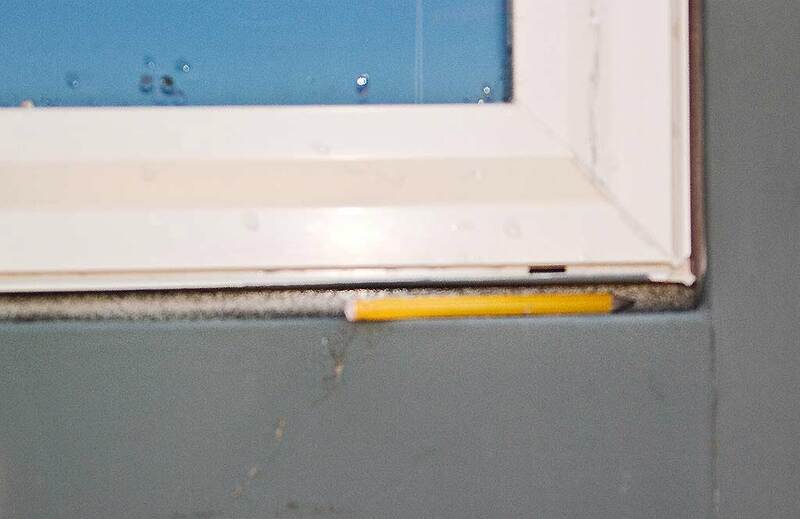 Windows behind stone left unsealed despite code, manufacturer, architect, owner instructions. Builder left windows without seal and with OSB and Tyvek openings. 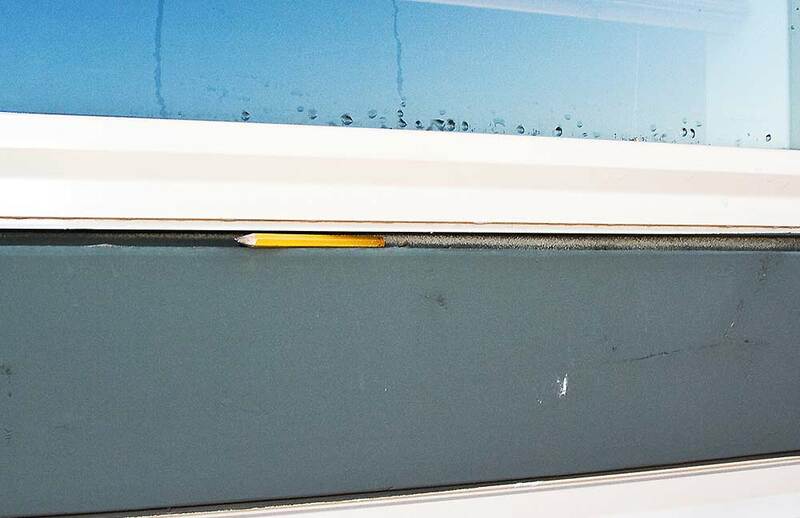 We sealed the windows. How Rutherford Custom Homes should have done it. Beau Rutherford, was president of this construction company. His father Jim Rutherford touted himself as having 40 years of building experience, and according to Beau Rutherford, Jim Rutherford served as RCH paid consultant. 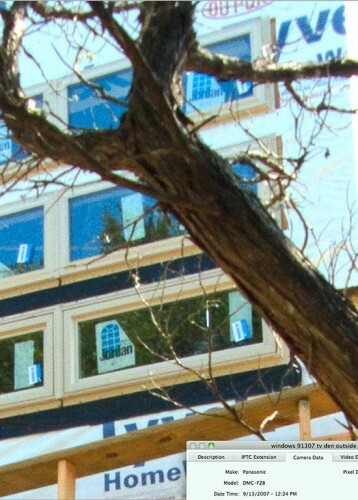 However, Rutherford Custom Homes was unable to build our home so that all windows wouldn’t leak. 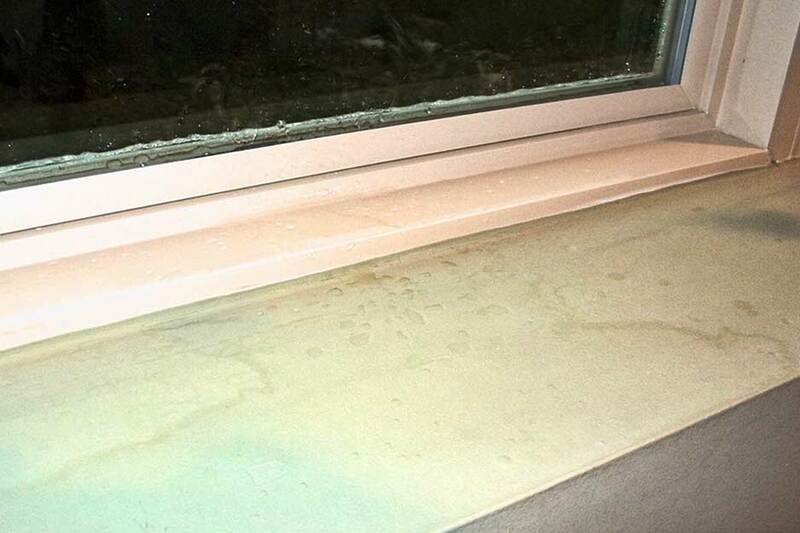 We found 28 leaking windows. This, despite explicit directions. 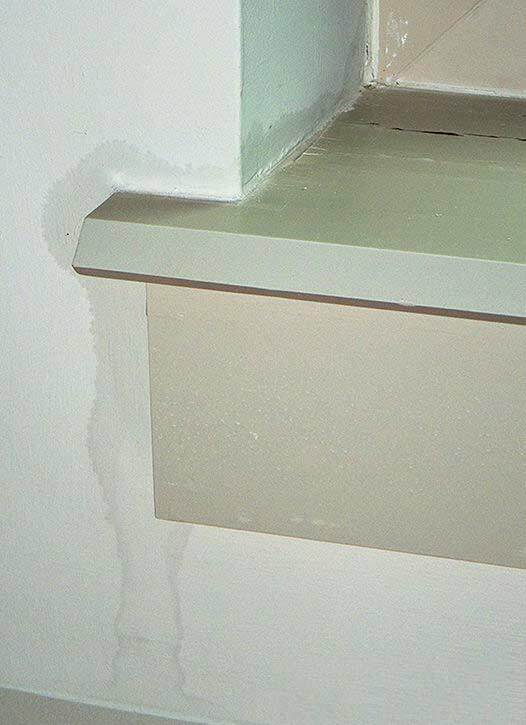 Then, after the first rains, our builders were unable to stop the leaks for 3 1/2 months, when we had to terminate them. With no construction experience, even we were able to do what the builders were unable to accomplish — weather-seal the windows. How did we do it? 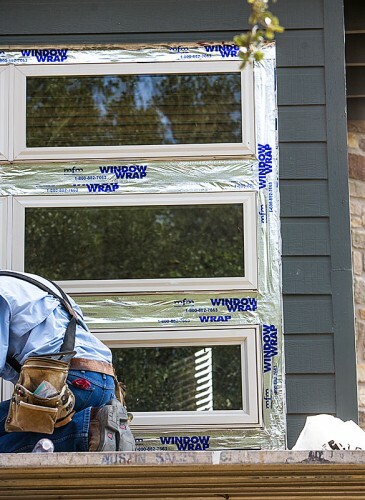 We looked at window manufacturers’ installation instructions and DuPont home building online, as well as question online building expert blogs. 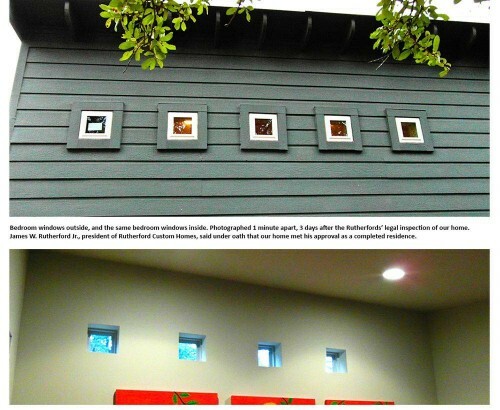 Plus, the contractors we hired not only knew how to build, they took pride in their work. 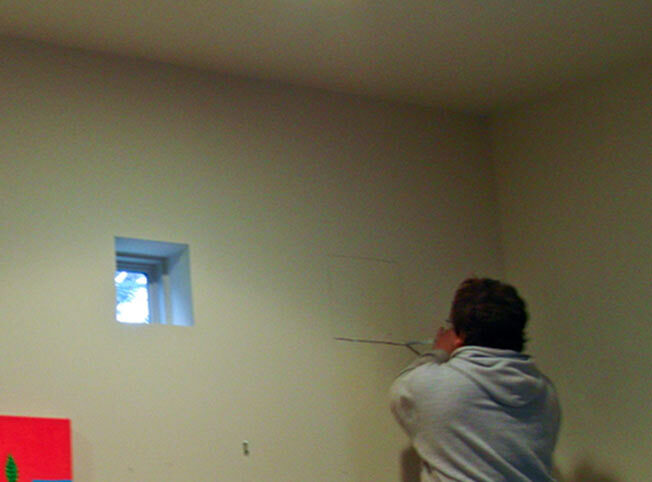 We weather-sealed the windows with peel and stick flashing. 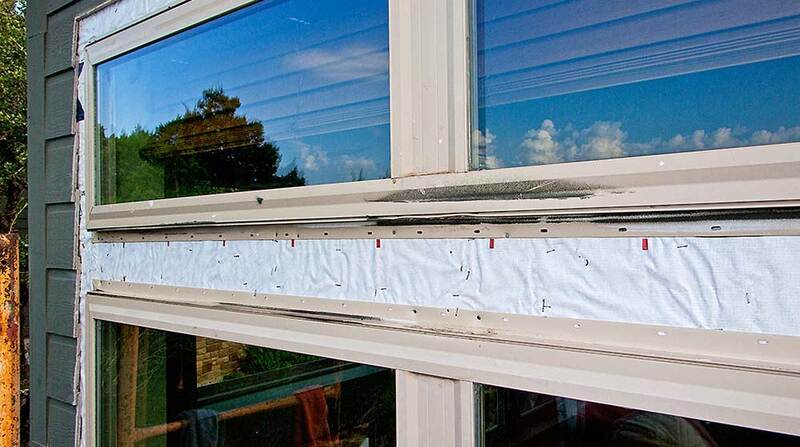 It wasn’t rocket science and DuPont, the maker of our Tyvek Home Wrap, has a good website for proper installation of windows and how to use their flashing products, none of which were used on our windows. In fact, all windows manufacturers we looked up at that time had almost identical examples of how to flash windows, and they all used peel and stick flashing. Rutherfords’ attorney asked our architect in his deposition about a redesign of the home 5 years after the fact to mitigate water intrusion from their unsealed windows.